Current Thin Lizzy guitarist Damon Johnson hails predecessor Brian Robertson as "a tremendous and special player"
The current Thin Lizzy and Black Star Riders guitarist says he has spent decades learning his predecessor’s parts, particularly on the 1978 album Live And Dangerous – and he says he’s still left in awe of Robertson’s work. Johnson continues: “It is inconceivable that Brian was only 21-years-old when these performances were recorded. And after decades of studying and practicing to all the Thin Lizzy albums with the classic lineup of Lynott/Gorham/Downey/Robertson, there are so many moments in Brian’s playing that elude me as to what he was thinking, where on the neck he is playing, and how he is approaching his solos. Case in point – his blistering improv at the end of Are You Ready. 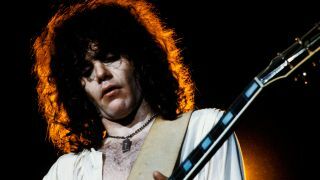 Robertson left the band in 1978 and was replaced by Gary Moore. He also had a brief stint in Motorhead, appearing on their 1983 album Another Perfect Day. Thin Lizzy are performing a string of European shows to commemorate the 30th anniversary of the death of their frontman Phil Lynott and to celebrate 40 years since the release of their iconic Jailbreak album.